Started in 2002 nowadays Superlon Baltuic UAB is the biggest flexible HR moulded foam manufacturer in Baltic States. 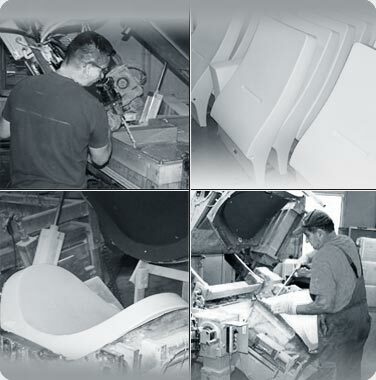 According to customers request we are producing different density, hardness and flexibility moulded HR foam for upholstered and office furniture, medical equipment, boats and automotive industry. We have fully automated production line. The raw materials are transferred from the storage tank facility to the mixing tank through a closed computer-controlled system. Filling of the moulds is also automated and performed by robot system. This system allows to guaranty continues quality of the foam, flexible production and optimal usage of raw materials which leads to the best quality/price rate. Computer controlled operation flow system allows to react fast to the customers’ requests, choosing the best raw material mixing formula for every individual project. Production process goes in closed system without use of ozone destructive CFC gas. After reaction is finished foam product is 100% finished and stable and does not give any pollution of waste gases or harmful toxins.